Llanfairpwllgwyngyllgogerychwyrndrobwllllantysiliogogogoch (llan-vire-pooll-guin-gill-go-ger-u-queern-drob-ooll-llandus-ilio-gogo-goch) (usually known as Llanfair-pwll or Llanfairpwllgwyngyll) is a Welsh word which translates roughly as "St Mary's Church in the Hollow of the White Hazel near a Rapid Whirlpool and the Church of St. Tysilio near the Red Cave". 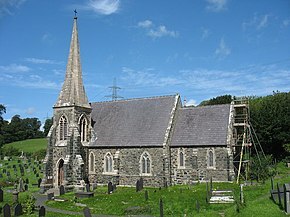 The name was coined as a publicity gimmick in the 1860s by concatenating the names of Llanfairpwllgwyngyll ("St Mary's church in the hollow of the white hazel"), the nearby hamlet of Llantysilio Gogogoch ("the church of St Tysilio of the red cave"), and the chwyrn drobwll ("rapid whirlpool") between them. It was the longest place name in an English-speaking country, but has been challenged by Llanfynydd (which unofficially changed its name to something longer) and a train stop elsewhere in Wales, but neither of these has received official recognition. Locals refer to the village as Llanfair, or as Llanfair PG (pronounced roughly "Hlan-var Pee Gee") to distinguish it from other places in Wales called "Llanfair(something)". Although typed as 58 characters, it is only 50 letters, because in Welsh ll ng and ch are treated as single letters. The village is divided into two sections. The upper village has mostly older residences and the lower village has newer commercial buildings and the train station. 53.221-4.2091 Llanfairpwll railway station is a request stop on the main line between Holyhead and Bangor. It is also reachable by car via the Menai Suspension Bridge. 53.220965-4.209311 Rail Station platform sign. The main attraction in town is easy to find: it's the town's name spelled out on a long sign at the train station. The name is also used on several nearby signs within town, although Llanfairpwllgwyngyll is used on some signs there and on road signs leading to it. 53.217726-4.1926572 St Mary's Church. Visit the town's eponymous church. 53.202599-4.215414 Plas Newydd Country House and Gardens, Llanfairpwll, Anglesey, LL61 6DQ, ☎ +44 1248 714795, e-mail: plasnewydd@nationaltrust.org.uk. 12:00 - 16:30. National Trust owned. Home of the Marquess of Anglesey that was built in the 18th century. 53.163774-4.2791531 Anglesey Sea Zoo and Marine Resource Centre, Brynsiencyn, LL61 6TQ, ☎ +44 1248 430411, e-mail: post@angleseyseazoo.co.uk. Open early February through early November. Wales' largest marine aquarium, re-creating the habitats of the fauna and flora found around Anglesey and the North Wales coastline, educational as well as entertaining. Adult £5.95, senior £5,50, child/student £4.95. 53.231992-4.1739472 Anglesey Walking Holidays, 3 Penrallt, Menai Bridge, Anglesey LL59 5LP, ☎ +44 1248 713611, e-mail: info@angleseywalkingholidays.com. Tailor made walking and cycling holidays on the Isle of Anglesey Coastal Path, Snowdonia, Wales Coast Path (North Section) and Offa's Dyke - packages include accommodation, luggage transfers, maps, routes. There are many hand craft shops in Llanfairpwll, including Pringles (near the train station). Loads of hand crafted goods. The Marquis Restaurant, Holyhead Road, ☎ +44 1248 713340. The Penrhos Arms, Holyhead Road. Go to a pub: there is one opposite the train station. 53.190682-4.2331891 Plas Coch Holiday Park, Llanedwen, Anglesey, LL61 6EJ, ☎ +44 1248 711920, toll-free: +44 800 717 707, e-mail: enquiries@plascochholidayhomes.co.uk. Awarded 5* by the Wales Tourist Board, it is set in over 60 acres of parkland near the Menai Straits. 53.219589-4.1904262 Gwesty Carreg Bran Hotel, Church Lane, LL61 5YH, ☎ +44 1248 719134. Carreg Goch, ☎ +44 1248 430315. 53.1899-4.30483 The Outbuildings, Bodowyr Farm, Llangaffo, Anglesey LL60 6NH, ☎ +44 1248 430132, e-mail: info@theoutbuildings.co.uk. Restaurant with rooms. Five luxurious en-suite bedrooms, restaurant and events venue with wedding licence. £90. The other villages of Anglesey – Holyhead, Beaumaris, Menai Bridge, Llangefni, Ynys Llanddwyn – offer similar small-town Welsh character and remote seaside landscapes, including both lovely beaches and rugged cliffs. Beaumaris and Menai Bridge, where a bridge meets the mainland, are particularly close. This city travel guide to Llanfairpwllgwyngyll is a usable article. It has information on how to get there and on restaurants and hotels. An adventurous person could use this article, but please feel free to improve it by editing the page. This travel guide page was last edited at 17:18, on 20 March 2019 by Wikivoyage user Ibaman. Based on work by Wikivoyage users ThunderingTyphoons!, Inops, Traveler100bot, AndreeBot, Ground Zero and Ikan Kekek, Wikivoyage anonymous users 89.77.243.27, 101.160.12.37 and 202.166.30.111 and others.